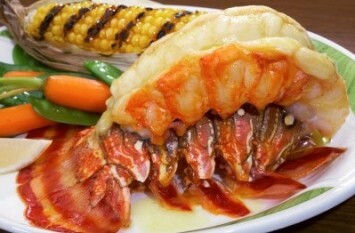 I think lobster tails are my all time, absolute favorite meal. This recipe will show you exactly how to broil the tails so they come out perfect every time. Don’t be afraid to cook lobster. Like all of our recipes, it isn’t really difficult at all. Just read the instructions and give it a try. Fresh lobster is always best, but if you only have access to raw, frozen tails they will still taste great. Just thaw them thoroughly and dry them off with paper towels. With kitchen shears, cut away the thin under the shell lining of the tail. To keep the tails from curling while they broil, bend each one backward toward the shell to crack it, or insert a skewer lengthwise between the shell and the meat. Place the tails on a rack in the broiler with the shell side up and about 3 inches below the heat element. Broil for 5 minutes. Turn the tails so the flesh side is up, brush the top of the lobster meat with melted butter, sprinkle with paprika, and broil for 6-8 more minutes, depending on the size of the tail. Serve this delectable broiled seafood with extra melted butter in small bowls and lemon wedges. Drizzle the tails with lemon juice and dip the pieces into the butter. Heaven! Serve 1 or two lobster tails per person. Have you ever asked people what their dream meal would be? Mine is lobster – no question about it. Broiled lobster is amazing. It has just a hint of grill taste which obviously isn’t there when you boil it (although you can’t go wrong with boiled lobster either). I serve the broiled lobster tails with caesar salad and a bit of pasta with alfredo sauce. Altogether, it seems like the perfect meal to me. This is a wonderful diabetic recipe. For diabetics, I would omit the pasta alfredo and serve the tails with lots of caesar salad and some vegetable quinoa. If you like this recipe, I’d love you to Pin it to Pinterest, Tweet about it, Like it on Facebook and leave your own favorite recipes below.